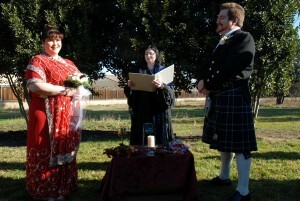 ﻿ tarotpathways.com » Rose Red and Andrew Are Married! Rose Red and Andrew Are Married! 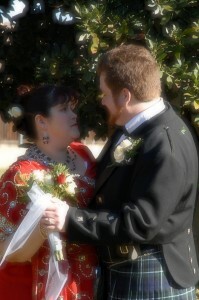 For those who’ve been following the romance of Rose Red and Andrew, they are married as of about six hours ago! Despite a chilly morning, the sun came out and suddenly the courtyard was filled with light and warmth, both physical and emotional. Surrounded by family and friends from all over, they had a short ceremony which I had the honor to celebrate. 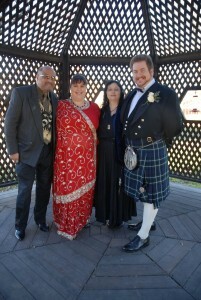 Rose Red was stunning in a beautiful red silk sari, and Andrew was the picture of elegance in a Victorian dress kilt. We wish them a happily ever after of love and joy! When is World Tarot Day for 2009? I would like to plan a tarot meetup group program with that theme.